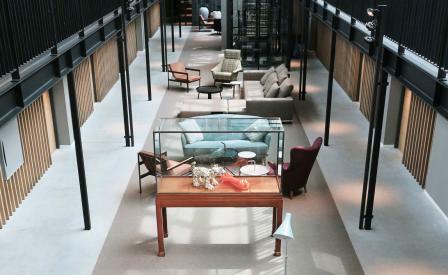 A former train depot dating from 1902, this industrial building in Amsterdam’s emerging neighbourhood, Oud-West, has been converted into a 55-room hotel by local hospitality maestro, Arjen van den Hof. The building’s original exposed bricks, high ceilings and steelwork have all been preserved by architecture firm J van Stigt, while interior studio Marco van Veldhuizen furnished the property with a mix of vintage and contemporary finds, including Tom Dixon lights, Eero Saarinen dining tables and suspension lamps by local design outfit, Vroonland & Vaandrager. The hotel’s restaurant, Remise 47, offers simple, seasonal classics, from fresh sea bass with shrimp risotto to steak tartare. Hotel De Hallen is the fifth property in the Vondel Hotel Group’s expanding portfolio, and is part of a series of buildings known as De Hallen Complex, which will soon include an art house cinema, television studio, library and indoor food market.